Jason Wilmont is staying on as Glebe Rangers as they move to the Ballymena League.INBM26-15 058SC. Glebe Rangers have confirmed they have applied to rejoin the Ballymena and Provinical Intermediate League. The Ballymoney side, who lost their place in Championship Two following a dramatic final day, were a dominant force in the league before their promotion to senior football some ten years ago. A statement released by the club following a committee meeting last week also confirmed Jason Wilmont will be staying on as the club bid to get back up to senior football as soon as possible. 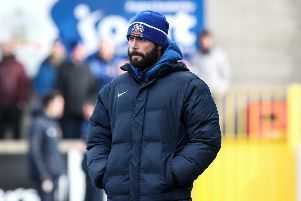 A spokesperson for the club said: “Less than a week after our disappointment of being relegated from NIFL Championship 2 football, everyone has been working tirelessly behind the scenes planning for the 2016/17 season. “As we are more than a club, it is very important to keep fans up to date as well. “Jason Wilmont and his coaching staff have all committed their services to the club and will be joined by Mo McDowell (Player/Coach) as he works towards his A Licence. “All players have confirmed that they have no intention on playing anywhere else next year, with a few having already turned down offers from higher level clubs. “Ryan Gurney and his team will continue their role as Reserve team management, leading the lads in the Coleraine & District Morning League.